It's been a busy summer, culminating in many moving observances of Battle Week here at 54 Pearl Street and in Brooklyn. On Sat., Aug. 16, I was honored to represent the SRNY at the Rawley Post, Brooklyn, for the opening event of the 1776 Battle Week ceremonies. This event commemorated the Maryland 400, the regiment that held the British long enough to assist the retreat across the East River of the bulk of Washington's Army. The service was sponsored by several Brooklyn-based organizations and attended by members of many NYC-based groups. A lone piper played Irish airs to open the ceremony, and later played Taps on the pipes as a wreath was placed on the Rawley Post Flag Pole in memory of the 400 Marylanders, most of whom are believed to be Irish immigrants or Irish-Americans. Although their mass grave has never been found, it is believed to lie under a local auto repair garage. At the conclusion of the service, the participants formed a parade line, and, led by the piper, marched to J.J. Byrne Park, the site of the Old Stone House, which was the nexus of the battle between the British, their Hessian allies, and the redoubtable Marylanders. An additional wreath was laid there, and stirring official proclamations were read in honor of the day. During the ceremonies, I announced SRNY plans for the Nov. 22 Evacuation Day Parade, and talked a bit about the autumn 2009 Magna Carta Exhibit at the Museum. Many groups indicated their strong interest in both events. I was also greatly honored when Mrs. Wilda Gallagher, widow of Revolutionary War scholar John J. Gallagher, presented me with an inscribed copy of Mr. Gallagher's seminal work The Battle of Brooklyn - 1776 , which she is donating to the Sons of the Revolution Library at Fraunces Tavern®. I was honored to participate in this event and was most impressed with the patriotic fervor of our fellow New Yorkers in the wonderful Borough of Brooklyn. On to fall! I call your attention to many wonderful upcoming events, including the commemoration of Nathan Hale on Sep. 22 and Evacuation Day observances on Nov. 20, 22, and 24. Additionally, you'll want to take note of our Magna Carta update and calendar of events. I look forward to seeing you soon. As part of the Museum's Battle Week 2008 observance, Dr. William J. Parry (Hunter College) presented a fascinating talk on Thurs., Aug. 21. His topic: Baron Herman Zedwitz, a German colonel in the Revolutionary War who was court-martialed for treason on Aug. 26, 1776. The trial resulted in a hung jury, yet Zedwitz was dismissed from the army and imprisoned for approximately three years. The Zedwitz court martial became the leading news of the day, overshadowing even the Battle of Long Island. In his talk, Dr. Parry explored the ways in which the trial was covered, Zedwitz's incarceration, his several escapes, and the final results of Zedwitz's numerous letters to Congress. Curious and colorful, certainly - but was Zedwitz also mad? In his letters from prison, Zedwitz complains - or raves? - about three mysterious men who tortured him with an electrical instrument; the men are mentioned over and over again. And what about the mysterious whispering room in which Zedwitz claims he was imprisoned in Philadelphia to drive him mad? Parry found no evidence that any of these things were real; in fact, Zedwitz was considered disordered in his senses at the time. But persistence paid off. After his third escape and re-capture, Zedwitz wrote one calm letter, a model of clarity, requesting that his family's welfare be considered; that he be given one set of clothes; and that he be released to the West Indies, from which he and his family could sail back to Europe. In July 1779, Zedwitz's request was granted - but did he ever leave America as promised? Dr. Parry concluded his talk with evidence that Zedwitz's wife remarried in 1780 and that his daughter died in Harrisburg in 1805. The trail ends there, for now. But what really happened to Herman Zedwitz? Will we ever know? Stay tuned - Dr. Parry is planning to write a book on the mysterious, curious Herman Zedwitz. Perhaps the answers will be made clear when the book is published ... or perhaps not. Two days before Dr. Parry's visit, Michael Callahan spoke on The King's Men: The British Army Fights the Battle of Brooklyn. In his excellent talk, Callahan discussed the British Army and German Auxiliary forces who fought during the New York Campaign of 1776, focusing on recruitment, training, uniforms, weapons and the backgrounds of officers and men. As always, Park Ranger Callahan's talk was lively and well received. Starting this fall, the Knickerbocker Chapter will hold its meetings at 54 Pearl Street as guests of the SRNY. Additionally, we are especially pleased to announce that the Knickerbockers will be SRNY's partner in George Washington's Birthday Ball on Feb. 19, 2009. They will provide invaluable assistance in planning this event and we look forward to a long collaboration. As information on the Knickerbockers' public events becomes available, we'll publish it here. From Sept. 26-28, members of SR Boards of Managers from across the country will gather in Marietta, GA, for a packed weekend of meetings, business sessions, tours, and good fellowship. On Friday evening, the 27th, the SRNY will host a pre-dinner reception at the renowned Marietta Gone With the Wind Museum: Scarlett on the Square (opened 2003). President John Mauk Hilliard and SRNY members invite our compatriots in Marietta to join us for a refreshing selection of beer and wine before digging into Sam and Dave's BBQ2 feast hosted by the Georgia Society. We look forward to greeting you! The answer is: Ward's statue of Washington. Stay tuned for a new quiz in October. Happy autumn to all! We're pleased to report that plans are progressing for the exhibition of Lincoln Cathedral's copy of Magna Carta at 54 Pearl Street. On Monday, August 11, the Very Rev. Philip Buckler, Dean of Lincoln Cathedral, and John Mauk Hilliard, SRNY President, signed the loan agreement for Magna Carta. The exhibition, which will also include key American documents, is scheduled to open in autumn 2009. Finalized dates will be announced in November 2008. According to the British Library, many copies of this grant, which later became known as Magna Carta, were sent out to bishops, sheriffs and other officials throughout the country. It is not known exactly how many were issued, but four now survive, one in Lincoln, one in Salisbury and two in the British Library. 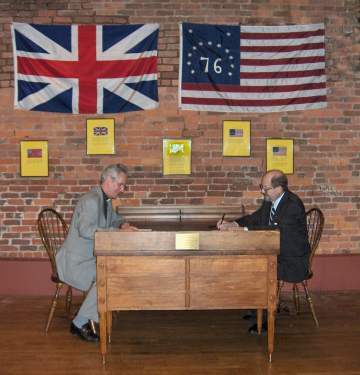 Sitting at the reproduction of George Washington's desk, Dean Buckler (l.) and President Hilliard sign the loan agreement. 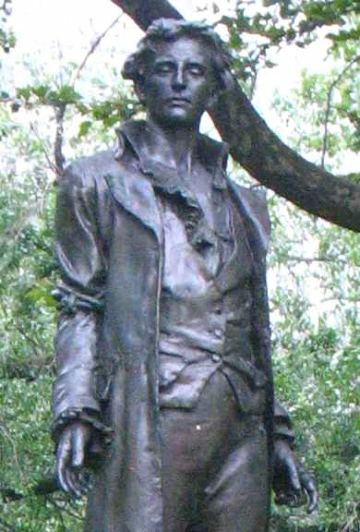 On the evening of Sep. 21, 1776, Nathan Hale was captured by the British somewhere near the American lines in Manhattan. Without a trial, he was hung as a spy at 11 a.m. the very next morning. Each year, the SRNY honors this brave young Patriot with a special ceremony at City Hall Plaza. This year, the ceremony will take place on Mon., Sep. 22, at 12 noon, near the statue of Nathan Hale donated by SRNY to the City of New York in 1893. The event is free and open to the public, but a police security check is required. If you wish to attend, please arrive early to allow time for screening. 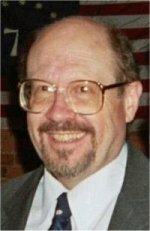 A final note: our thanks to SRNY Second VP and Board of Managers Member Kenneth H. Chase for his generous gift of $750.00. Mr. Chase's gift was used to conserve the Nathan Hale letter in the collection of Fraunces Tavern® Museum. Read the letter and more about Nathan Hale here. Mon. Nov. 24, 6:30 p.m.: A Gala Evening Not to Be Missed Evacuation Day Dinner at 54 Pearl Street; reservations required. Join us for these exciting events to celebrate the 225th anniversary of Evacuation Day. Thurs., Nov. 20 at 6:30 p.m.: Barnet Schecter Returns! Historian Barnet Schecter, author of The Battle for New York: The City at the Heart of the American Revolution , will recount the dramatic yet peaceful transfer of New York to George Washington and his forces and the evacuation of loyalist refugees, including many former slaves. This carefully planned operation prevented major clashes between loyalists and patriots and set the stage for the rebirth of the heavily damaged city after seven years of military rule. The Battle of Yorktown (1781) is mistakenly remembered as the end of the American Revolution, but the war continued for two more years, ending finally with the British withdrawal from occupied New York City on November 25, 1783 -- Evacuation Day. Organized by the SRNY, this colorful parade will step off from City Hall Park and make its way down Broadway to the vicinity of Historic Battery Park. Patriotic societies and lineage groups will join with SRNY to make this a very special day. To cap the festivities, the Stars and Stripes will be raised, following the symbolic lowering of the Union Jack. More details will be posted in October. If your group or organization would like to march with us, please email Margaret O'Shaughnessy at 2administrator@sonsoftherevolution.org or call 212-425-1776. As always, SRNY will celebrate Evacuation Day with a delicious dinner, 13 historic toasts, and a very special program on Monday, Nov. 24, beginning with a reception in the Flag Gallery at 6:30 p.m. Dinner will follow at 7:30 p.m. Last year's event was sold out; we recommend that you reserve early: 2administrator@sonsoftherevolution.org. See you there!